VPVP has been updating MikuMikuDance every few days for a couple of weeks. Each new version simply replaces all previous versions … and no hint of the previous versions remains on the VPVP page … like they never happened/were never released. BUT … in an attempt to be on the leading-edge of all things MMD, LearnMMD.com downloaded each version and makes them available to you here, if you want them. Consider them to be Collectors items! MMD 8.01, released on July 5th, 2013 Features a NEW Desktop icon … a new look! Even so, it lasted only a few days until, on July 8th, it was replaced by MMD 8.03! You might want to Download MMD 8.01 as an historical artifact! It lasted only a few days before it was replaced by MMD 8.01 on July 5th! Download MMD 7.99 just to say you own it. 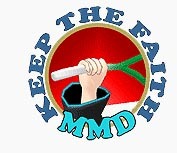 MMD 7.39 was “the standard” for several years before this recent rash of updates erupted. See the LearnMMD Downloads page for your copy! Download Previous Versions of MikuMikuDance from LearnMMD.com!